Hello! I'm here to solicit advice on how to improve my rye breads with the considerable limitations I have in flour variety and quality available to me. After baking my way happily through his blog, I recently bought The Rye Baker by Stanley Ginsberg and started dog-earing recipes to try. 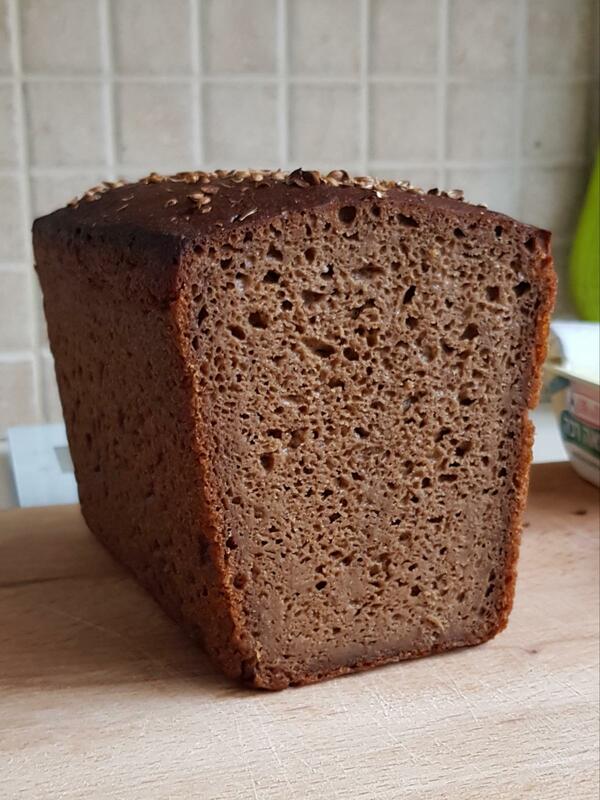 The second one I made is this Borodinsky bread, based on 65% medium rye, 20% bread flour and 15% course rye meal fortified with red rye malt and molasses. Like other black Russian and Baltic breads it combines a lot of ripe sourdough sponge with a malted scald into a turbo sponge that leavens the loaf in only a couple of hours without any additional yeast, and perfumes the kitchen with outrageous smells of coffee, toffee, spices, booze and fruit. Not having access to medium rye or coarse meal, I subbed fine meal for all of the rye flour. I also subbed T60 crystal malt for the red malt based on a suggestion by Stanley. Instead of the ~2300 cc bread pan he calls for, I subbed a deep, 2000 cc Cadac cast iron bread pot, the closest thing I had, figuring the whole rye would give me a weaker rise anyway. The sponges and dough trucked along happily in my hot kitchen, happily hitting all the required benchmarks in more or less the time given, until I got to the 90-120 proof. 40 minutes in, I found myself rushing to preheat the oven as the dough threatened to overflow the pan. The bread took 15-20 minutes longer to bake than indicated, which I chalk up at least partially to my sluggish oven. The end result, as you can hopefully see, was not bad at all, deliciously flavor and fragrant though a little bit too far on the sour side, with a tender, glossy and open crumb. The bottom third was not as good at the rest, coming out gummy and dense. - it seemed like everything was on schedule, but I suspect that due to the fast proof and sour flavor that it was actually ahead of schedule and over fermented slightly resulting in the dreaded rye goo - the higher fiber content meant that the sponge and dough expand less despite fermenting faster, and in my hot kitchen I should have moved on to the next stages earlier. - you can see that the right side of the loaf, which faced the colder front of my oven during the initial high temp steam bake, rose less and was just a tiny bit gummier. This makes me think that a longer preheat and a thinner walled aluminum pan could reduce some of the density. - six inches is too deep a pan for high percentage rye bread - the depth and narrow sides may have squeezed the gasses out of the dough at the bottom. The bread may also have been slightly under proofed when I baked it. Next time I'll use a shallower aluminum pan and scale the recipe. - the scald didn't seem as sweet as it should have been - perhaps the use of flour instead of coarse meal lowered the effective hydration, hampering sugar extraction? It was difficult to effectively moisten all the flour when I mixed it. - obviously, subbing whole for medium rye resulted in a denser, more vigorous dough, maybe next time I could use 30% high extraction flour instead of 20% BF to get a more similar ash/protein profile? Any and all comment and tips welcome! That is a spectacular Borodinsky! The fragrance while the bread baked must have been mouth-watering. You got it into the oven in the nick of time, as you can see from the pinhole bubbles starting to appear on the top of the dough. The crust could have been a little darker IMO, though with the dark molasses malt crumb it's hardly a complaint. It's barely noticeable when eaten as is but crisps up nicely after toasting - probably helps that the pan was heavily greased. Actually, judging by the collapsed crumb on the bottom he probably was a bit late. I wasn't sure whether to attribute that to overproofing or just the height of the loaf overloading the lower part. There are some other regions in the lower third of the loaf that have a somewhat compressed appearance, as well. It may be overloading, althought the cross section looks righ size-wise, but any overloading will be exacerbated by overproofing. Rough handling is another possible cuplrit. This is a very fine looking bread! I'll bet it tastes as good as it looks. These variations based on ingredients available on hand are always instructive. Flour scalds are a known process, so even if not called for specifically here, it's an interesting test. Your crumb looks fantastic. How long did you wait to cut into it? Other than a few dense patches, that crumb is first rate. What form of red rye malt did you use? Appreciate the kind words :) I definitely enjoyed it, though I would make it just a hair less sour and more sweet. I used T60 Crystal (barley) malt from a brew shop, ground in my spice grinder, which Stanley Ginsberg suggested after I asked him on his blog for a substitute suggestion. I've had good results with it so far, though I plan on eventually roasting and grinding up some rye malt I found to compare. Not trusting my own palate despite my Russian heritage, I gave some slices to an older Russian coworker to take home who then stopped me in the hall the next day to rhapsodize about its authenticity (it's near impossible to get this kind of bread in Israel). To my palate, there's a faint barley flavor, but it may just be my imagination. The photo is after 12 hours, but annoyingly the crumb still smears a little on the knife after four days and I have to be careful not to damage it when buttering it. If I could improve one thing about the bread that would definitely be the one. The Russian and Belarusian women I've been conferring with about Bordinsky say that actual RRM tastes nothing like toasted malted rye. One of them sent me some, but I have yet to try it. They also tell me that the scald stage is heated to a very specific temp, as opposed to mixing with boiling water and hoping for the best. I've never measured the strike temp of the scald, or at any stage, but my Ginsberg Borodinsky bakes have been incredible, and sweeter than they are sour. The idea that they could be even better is hard to imagine. You can check my Borodinsky posts here. The faux RRM is great in other breads, too. I've been disciplined about waiting 48 hours. I assume your crumb is a bit softer from not using coarse rye in the scald, though. The Belarusian also uses wheat scalds in wheat breads. I've read too that scalds need to be held at a certain temperature - usually 70 degrees celsius I think? I previously figured Stanley has us adding boiling water since we're not incubating - so that the scald spends as much time as possible in the effective temperature range. I actually added boiling water to flour that was straight from the freezer and incubated it in a big bowl of boiled water in the microwave, so it should have stayed in the right range a little longer. I now suspect that in his recipes, the scald is mostly extracting sugar already present in the malt and gelatinizing the grain, with any actual enzyme activity being secondary, but in any case, compared to other recipes of his, the mash tasted noticeably less sweet. I had a look at your Borodinsky bakes - I can't even imagine processing so much of such a sticky dough! The crumb looks perfect, I think you've convinced me that it's worth the effort to grind up some rye berries for my next batch. Why thanks! I've been having it for breakfast actually (and sometimes afternoon snacks - aforementioned cheese included). A slice of this bread with nothing but a thin slick of butter and a mug of milky coffee will keep you full for hours. The first comment. With the heavier form, the loaf might have fermented more before heating up the dough. Use the same form but get it in sooner. With a thinner pan the baking time will change. Don't let it rise above the edge of the pan, get it in before pin holes start appearing everywhere on the surface. The crumb shows a light but decernable tapered falling in the middle with dense area near to the bottom, funnel shaped. I'm sure not caused by the height/weight of the dough. Simple to just shorten the final rise. Then it will look a lot better. That one main tweak. Tip: Even with this advanced stage, the dough around the edge can be shaped further running a wet spatula or thin scraper pressing lightly around the edge (slanting/curving toward the middle of the loaf) to prevent a meniscus or sharp edge running around the top of the loaf. Tips for rye breads: Save a few slices to toss half or a whole slice into the next loaf as "Altus." Freeze until ready. Toast and crumble into liquids to soften and mash up before adding flour. This action will increase the volume and flavour of the dough so if your pan is borderline full....just forget it or reduce the recipe to get it in. :). about the overfermentation. Definitely shortening the time line next time. I didn't really think about shortening the proof, for some reason. You don't think it might be worth shortening the bulk ferment as well? I actually did coax the top of the loaf away from the edges a bit with a wet spatula while I waited for the oven to heat up properly, right before hitting it up with the spice. Might be the only thing that saved me from a blowout. Surprisingly, I actually encountered some pretty serious roof separation as I got to the end of the loaf. don't forget to dock the dough before baking. Use a wet toothpick or something similar and poke lots of holes to deflate large air pockets. Stanley doesn't call for docking in the recipe for his version of Borodinsky.